On many levels, Facebook is fascinating — an interactive, image-laden directory featuring groups that share lifestyles or attitudes. Many students find it addictive, as evidenced by discussion groups with names like “Addicted to the Facebook,” which boasts 330 members at Iowa State. Nationwide, Facebook tallies 250 million hits every day and ranks ninth in overall traffic on the Internet. The other question is Helen Barrett’s, what can we learn from these ePortfolios that will better inform how we think about ePortfolio work within universities? Last night I attended the Moscow Planning and Zoning Commission’s hearing on a proposal to rezone 77 acres to Motor Business. (Follow this thread at a blog called NoSuperWalMart ). What struck me this morning was how similar that meeting was to barn raisings I’ve led. Last night, an assorted group people came together and built an argument against the rezone. They built something richer, and bigger, than any of them. They found roles to fit their own abilities, from orator to child care. As the evening went on, I think we all had a growing satisfaction in both the collective effort and what it was creating. 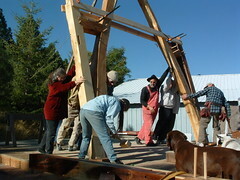 Unlike a barn raising, now we have to wait to learn if our argument will stand up. I am working with a student interested in researching how MySpace and Facebook are used. My own interest is to learn more about these two tools and how we might apply that knowledge to university supported teaching and learning resources and activities. and my blog there is here http://blog.myspace.com/nils_peterson. This looks like a re-invention of del.icio.us. I can tag a URL and add notes about the page. But in addition to having notes, I can place the notes spatially on the page — the sticky note metaphor. What do you do if you own a wiki? Not only did I get WordPress for my blog, in the same package from DreamHost, I got MediaWiki 1.5.6. I’m still configuring it, but what on earth does a person do with such a powerful tool? I have MoscowWiki for experimentation with a community wiki, so I don’t need my wiki for that. And mine is branded with the nilspeterson.com domain. So, I’m still puzzling. Perhaps I should write a hypertextual novel. What are the new challenges and opportunities provided by the rapidly emerging computer technology options for “blogging,” “podcasting,” and other new forms of telecommunications, information exchange, and social networking? Where are the lines between personal blogging, political blogging, and course-related blogging? Having just moved my blogging from a university hosted resource to my own domain because my personal and research interests were leading me onto ground where I might be seen as using state resources inappropriately, this last question got my attention. Here is a bit of a story. In the 90’s I was Director of Educational Technology for the College of Education at WSU. I was thinking about questions like, should faculty be rewarded for use of technology (eg tenure and promotion). Initially, I thought yes, but later moved to think not. I concluded, faculty should be expected to be doing leading edge work in their fields. To do so they must necessarily use the appropriate tools and methods. Traditional focus on professional work would bring along authentic uses of technology, focus on technology per se would advance a variety of artificial and perhaps ill-concieved behaviors. In that job I also watched faculty who found that the computer the university could afford to provide them was inadequate to the work they needed to do. Some had purchased computers at home that suited their needs. The result was, when the faculty came to work, they were impaired in actually doing their work by the environment provided by the institution. I became further radicalized, concluding that the university was doing faculty a disservice by leading them to believe it should/would provide their computing. Computing was becoming too personal, too personally important, to leave it to the institution to provide. I went out, bought a laptop and ceased using university computers as my primary work platforms. This choice also solved some of the appropriate use issues that using state computers posed. What email is it approipriate to read/ send on a state machine? In 2004, I helped launch a blogging resource for WSU, and was active there. But recently, my interests in collaborative online group work led me into a role with a campaign against a Wal-Mart SuperCenter in Moscow, Idaho. Our opponents began to question if my use of a university-based identity (an email address) or a university-based blog was ethical. The easiest solution, following on the line of my previous reasoning, was to step out of the university. This is a very “Web 2.0” solution. I may, when I finish moving, bring some RSS from my identity into my university web page, but that will be just a place to share parts of me. I am not going to divide my mind between that which my employer sanctions and that which interests me, but I may divide what I present on my employer’s premesis (much like I dress a certain way to come to work, or use certain language). WSU enters the enterprise blog era. What was important about that post was it ushered in the beginning of Washington State University having an enterprise blog resource. Now, WSU is exploring moving off that platform (.Text, an open source effort that died) and onto a new platform (ELGG or WordPress are front runners right now). But even as that is happening, conversations within CTLT are leading me to understand that students (and staff) can’t build their own reputations within an enterprise system. This week I bought the NilsPeterson domain, and started the process of stepping out of my university home. So now, when asked, what is your home page, I’ll say http://www.nilspeterson.com rather than ctlt.wsu.edu/staff/nils_peterson. Watch for more of this saga as I “move” my “reputation” in Google and Technorati from the university to here. You are currently browsing the One small step for man blog archives for February, 2006.